A pair of speakers worn over or in the ears so only the wearer can hear the sounds emitted. For tagging purposes, this tag covers devices where the two speakers are held in place by a strap over or behind the head and usually cover the entire ear. For devices not held in place by a strap over or behind the head, see earphones, earbuds instead. For images of Toyosatomimi no Miko, please tag earmuffs instead unless it is apparent that the artist is intentionally depicting them as headphones (e.g., music, a wire coming from them). The following tags are aliased to this tag: headphone (learn more). 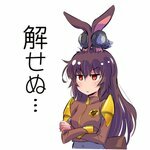 The following tags implicate this tag: headphones_around_neck, bunny_headphones, cat_ear_headphones, headphones_removed (learn more).